Home Disc Labels for Mac is a CD/DVD disc label designer software for Mac OS X that helps you to create CD/DVD labels using various built-in label formats, clipart images, and layouts provided. Various objects, like text, graphics and images can be easely added to your documents. Numerous image effects, like opacity level and image mask, in combination with other settings allow you to make visually stunning effects. - Home Disc Labels for Mac support insert table to label. 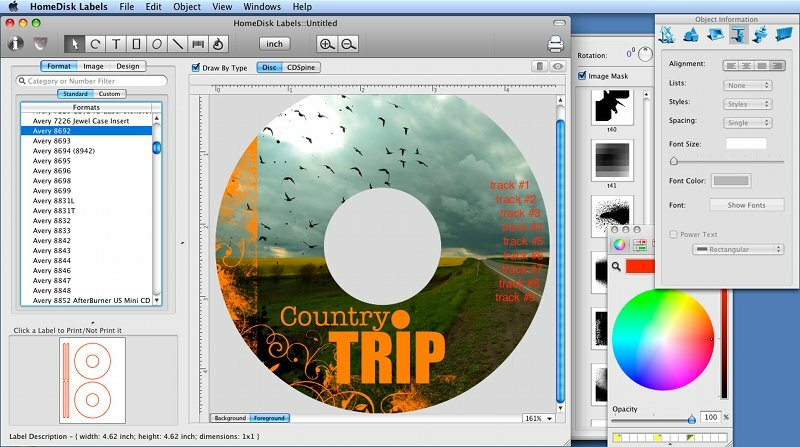 CD/DVD disk label designer for mac. Qweas is providing links to Home Disc Labels for Mac 1.9.5 as a courtesy, and makes no representations regarding Home Disc Labels for Mac or any other applications or any information related thereto. Any questions, complaints or claims regarding this application Home Disc Labels for Mac 1.9.5 must be directed to the appropriate software vendor. You may click the publisher link of Home Disc Labels for Mac on the top of this page to get more details about the vendor.